In 2006 I spoke in front of an audience for the first time, and I was horrible. I didn’t consider what my audience should get from my speech. I only thought about how I would be perceived. Cringe. I was so self absorbed that when I heard someone in the back of the room whispering to another person it took me a good 5 minutes to get back to what I was speaking about. I’d completely lost track. I crashed and burned, but I had to start somewhere. The one thing I did right was that I was pushing myself. I wanted to eventually get paid to speak. So I started small and began to volunteer my services. I got out there and spoke and spoke and spoke and spoke. 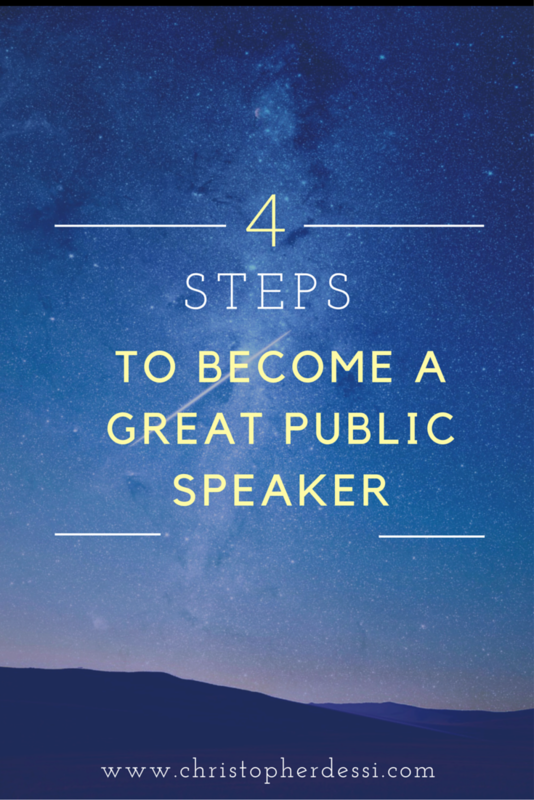 If you want to be a great public speaker I recommend you do the same. Here are four pointers that will help you get a better start out of the gates. I’ve been on stage in front of 500 people, and I’ve spoken to a class with 3 people. Each time I realized that fear is not real. It’s a product of our imagination. Fear is a choice. So is success. I decided that I wanted to speak publicly, and I went about working on my craft. I live and breathe digital media. I blog about it, I attend conferences, heck I even produce conferences. I’m always reading, and listening to audio-books. I’ve listened to just over 20 audio books already in 2014. I listen when I work out and while I’m commuting. I’ve created a state of constant preparation. Books about being an entrepreneur. Books about success and mindset. Books about personal magnetism (seriously, it’s fascinating). They all prepare me for when I hit the stage. If you’re prepared you’re fear will evaporate. So prepare, practice, & speak to someone you love and trust who will give you feedback. Did I mention practice? Practice like crazy. Practice whenever you can,for as long as you can. Practice in a mirror. If you’re just starting out ask that they record you while speaking. Make sure that you analyze the video. It’s not easy watching yourself speak, but it will pay off dividends. This is a tough one. I generally run hot, and I tend to sweat on my face, particularly on my upper lip. Not such a big deal when I’m on a stage, but horrible when I’m being broadcast nationally in HDTV. I’m also very excitable. I’m super passionate about what I do and I tend to take shallow breaths when I speak. Sometimes this is ok if you’re communicating excitement, but be aware that these non verbal cues can make you and can certainly break you. If you’re not breathing, you’re going to get anxious. If you’re anxious you won’t be able to think on your feet. If you can’t think on your feet, you could get distracted. If you get distracted you may panic. If you panic you may sweat, wring your hands etc. If you sweat, wring your hands etc, you will lose the audience. They will think you don’t know what you’re speaking about and will automatically tune you out. My friend Jack Nazarian gave me a great tip recently. He uses a breathing technique that is utilized by military sharpshooters. Slowing down is a funny thing. I talk fast. I’m a New Yorker, it’s just the way I’m wired, so I probably shouldn’t even be giving this advice if I have trouble following it myself – but maybe that’s why it’s so important. It’s hard to slow down. You have so much to say, and you want to make sure you cover it all. You want to impress. You want to flex your intellectual muscles. The last time I spoke I stopped speaking for about 7 seconds. It felt like an eternity in my head. To the audience it drew them in. I was communicating a point. I needed there to be silence in the room to articulate a powerful moment in my life when I could not longer speak. So slow down, allow for silence throughout the course of your speech. It will only make you nervous, and it will draw the audience in. This may be the most obvious one, but if you’ve ever done any public speaking, you know what I mean. You need to express yourself in front of an audience,so make sure you square your shoulders and face the people you’re addressing. I learned this the hard way. I was conducted a social media seminar in a theatre in New York City. At the end of the event, the owner of the theatre let me know that he felt the content of what I was speaking about was great, but that I lost the audience when I would lose eye contact. He then proceeded to get up and imitate me, looking down at my shoes, and walking from one end of the stage to the other. Head down, shuffling my feet and speaking to the floor. Embarrassing. Square your shoulders, body erect, breathe, face the audience and speak! What did I miss? Add in the comments below.